State forest minister Ganpatsinh Vasava said on Tuesday that the tiger was caught on cameras set up by the forest department in that area. The tiger was first photographed by a teacher in Gujarat's Mahisagar district. 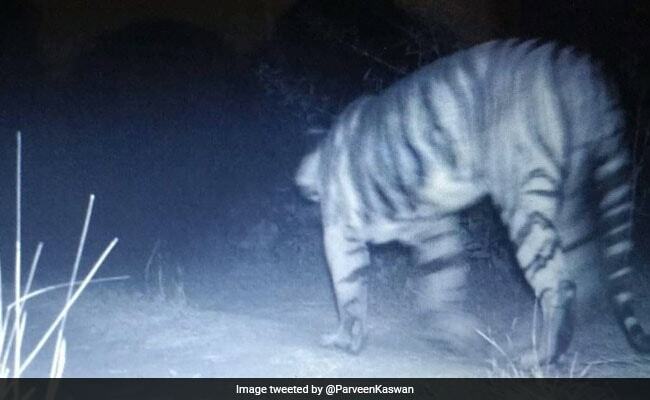 The Gujarat government has confirmed the presence of a tiger in the state, days after a man claimed he saw the big cat crossing a road in Mahisagar district. "It has now been confirmed. A tiger in the age-group of 7 to 8 years has been seen in Mahisagar district," Mr Vasava told reporters in Gandhinagar. The tiger was last seen in Gujarat in 1989. Subsequent surveys carried out every four years by the central government showed no presence of tiger in the state, he said. A local government school teacher had last week claimed that he saw a tiger crossing a road near Boriya village in Mahisagar, around 120 km from here, on February 6. The teacher clicked the animal''s picture on his mobile phone and shared it with friends on social media platforms. The photo soon went viral and based on the teacher's claim, the forest department department set up several camera traps in that area. Mr Vasava said the tiger might have come to Gujarat from any of the neighbouring states of Rajasthan, Madhya Pradesh or Maharashtra, where the striped animals are found. "The Madhya Pradesh government has said that a tiger has gone missing from Ujjain. It is possible that the tiger seen here can be from any of these neighbouring states which have tigers," the minister stated. He said the state government will now contact the National Tiger Conservation Authority (NTCA), which has the data of tigers across the country, to ascertain where the feline came from. The Wildlife Institute of India (WII) will also be involved to carry out a survey in the area to find out if this region is conducive for tigers, he said. "We now agree that there is a tiger in Gujarat. WII will study if the area could be developed for tigers. We are also seeking NTCA''s guidance," he said. Mr Vasava said it was yet to be ascertained how long and where the lone tiger had been roaming in Gujarat. "We are yet to ascertain if that area was the tiger's permanent residence or whether it migrated from neighbouring states. It is certain that Gujarat is also a part of tiger's natural corridor," he said. Principal Chief Conservator of Forests (Wildlife) Akshay Saxena said evidences like pug marks and scats, as well as hair and scratch marks on a tree had to some extent confirmed the tiger's presence in the region. "Later, camera traps were set up and we have now got visual evidence of a tiger in the area. It is not necessary that we will find the tiger in the same area, so we will continue to keep a watch," he said.